On the day of my birth I realise that I am but a child to the 96 year-old co-inventor of the Lithium-ion battery, John Bannister Goodenough. Born on born 25 July 1922 in Jena, Germany, Goodenough is an American professor and solid-state physicist. He is widely credited for the identification and development of the Li-ion rechargeable battery as well as for developing the Goodenough–Kanamori rules for determining the sign of the magnetic superexchange in materials. In 2014, he received the Charles Stark Draper Prize for his contributions to the lithium-ion battery. If it wasn’t for Goodenough’s pioneering work you wouldn’t be reading this article on your smartphone or contemplating purchasing an Electric Vehicle. A lithium-ion battery (Li-ion battery or LIB) is a type of rechargeable battery in which lithium ions move from the negative electrode to the positive electrode during discharge and back when charging. Li-ion batteries use an intercalated lithium compound as one electrode material, compared to the metallic lithium used in a non-rechargeable lithium battery. Lithium-ion batteries are common rechargeable batteries for portable electronics, with a high energy density, tiny memory effect and low self-discharge. LIBs are also growing in popularity for military, battery electric vehicle and aerospace applications. Member of the National Academy of Engineering, the National Academy of Sciences, French Academy of Sciences, and the Real Academia de Ciencias Exactas, Físicas y Naturales of Spain. He has authored more than 550 articles, 85 book chapters and reviews, and five books, including two seminal works, Magnetism and the Chemical Bond (1963) and Les oxydes des metaux de transition (1973). In 1980 at Oxford University, England, John Goodenough and Koichi Mizushima, both demonstrated a rechargeable lithium cell with voltage in the 4 V range using lithium cobalt oxide (LiCoO2) as the positive electrode and lithium metal as the negative electrode. Goodenough is a co-recipient of the 2009 Enrico Fermi Award. This presidential award is one of the oldest and most prestigious given by the U.S. government and carries an honorarium of $375,000. He shares the honor with Dr. Siegfried S. Hecker, professor at the Management Science and Engineering Department of Stanford University. In 2010 he was elected a Foreign Member of the Royal Society. On February 1, 2013, Goodenough was presented with the National Medal of Science. In 2015 he was listed along with M Stanley Whittingham, for pioneering research leading to the development of the lithium-ion battery on a list of Clarivate Citation Laureates for the Nobel Prize in Chemistry by Thomson Reuters. In 2017 he received the Welch Award in Chemistry. The Royal Society of Chemistry granted a John B Goodenough Award in his honour. 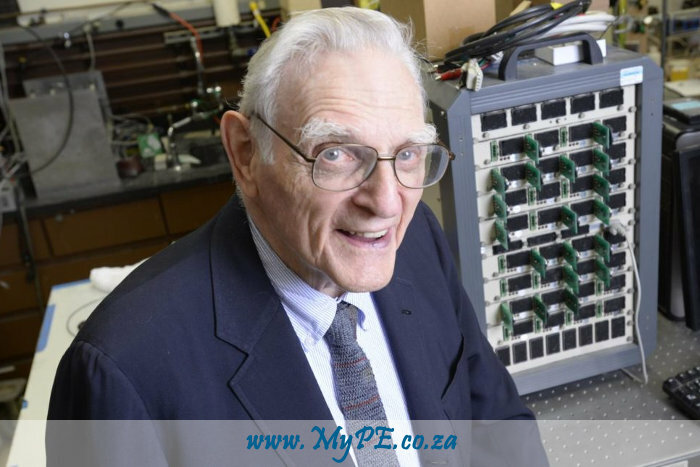 In 2017 the then 94 year-old Goodenough, professor in the Cockrell School of Engineering at The University of Texas at Austin, led a team of engineers and developed the first all-solid-state battery cells that could lead to safer, faster-charging, longer-lasting rechargeable batteries for handheld mobile devices, electric cars and stationary energy storage.